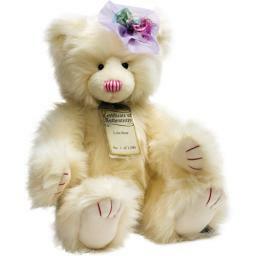 Lovely L-O-L-A Lola, a collectible bear from Collection 5. Lola has gorgeous pure white plush, with shaved ears, and velvety soft white pads. She has defined cerise pink fingers and toes. Lola's eyes are accentuated by white material, she has a shaved muzzle and a cute two-tone stripy pink nose. As with all the Silver Tag bears, Lola is fully jointed, substantially weighted, and has a classic hump. Lola comes with an individually numbered Certificate of Authenticity. She is 52 cm standing. Lola is one of 1500. She can be spot cleaned.